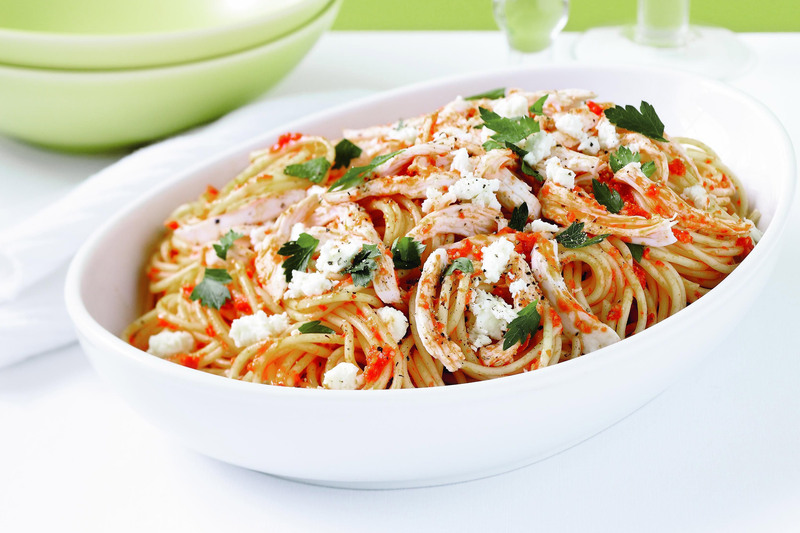 This tasty chicken spaghetti is low in fat but high in flavour! Bring a large frying pan of water to a gentle simmer over medium heat. Add the chicken and reduce heat to low. Cook for 10 minutes. Set aside for 30 minutes or until cooked through. Use a slotted spoon to transfer the chicken to a clean work surface. Coarsely shred. Meanwhile, preheat grill on high. Place the capsicum, skin-side up, on a baking tray and cook under grill for 8-10 minutes or until charred and blistered. Transfer into a sealable plastic bag and set aside for 5 minutes (this helps lift the skin). Peel the skin from the capsicum. Place the capsicum, semi-dried tomatoes, parmesan and garlic in the bowl of a food processor and process until coarsely chopped. With the motor running, gradually add the lemon juice and oil in a thin, steady stream until combined. Cook the pasta in a saucepan of salted boiling water following packet directions or until al dente. Drain. Return to the pan. Add the semi-dried tomato mixture and chicken to the pasta. Transfer to a serving platter and sprinkle over the feta and parsley. Season with pepper to serve.